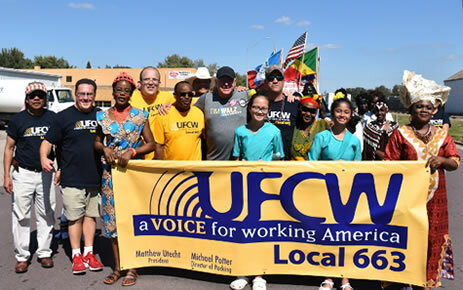 UFCW Local 663 members marched September 15 in the King Turkey Day parade in Worthington, Minnesota with Tim Walz, AFL-CIO endorsed and UFCW endorsed candidate for Minnesota Governor. MINNEAPOLIS —Members of Minneapolis-based UFCW Local 653 and Worthington-based UFCW Local 1161 voted August 16 to merge the two locals. “UFCW Locals 653 and 1161 have the opportunity to bargain better contracts, organize non-union competition, and have a stronger voice in local and state politics by merging our local unions. The newly-merged local is now UFCW Local 663. The former UFCW Local 1161’s majority of members worked in meat packing, with its largest employer in Worthington, Minnesota at the JBS pork processing plant. The former UFCW Local 653’s membership included workers in the grocery industry, healthcare, and retail. Union members from both locals expressed excitement about the opportunity to work together as one. “We’re stronger together. I know together we’ll be able to have even more muscle at the bargaining table to build even better contracts in the future. That’s important for my family, so we can live safer and happier lives,” said Khampiane Keophimphone, Local 1161 member at JBS Worthington. “It’s a win-win situation. Both of our locals are doing well, and it’s just the right thing to do to come together at a time when working people are under attack. I’m proud to stand up for workers like myself and others,” said Lee Borela, Local 653 member at Cub Foods. Former UFCW Local 653 president Matt Utecht will lead the newly-merged organization as president. Former UFCW Local 1161 president Michael Potter is now director of packing in the new organization. The new UFCW Local 663 website is www.ufcw663.org.